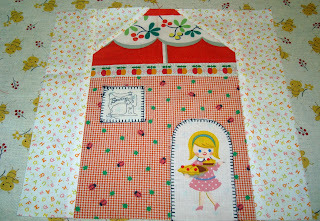 My previous house block I called a Cottage block. 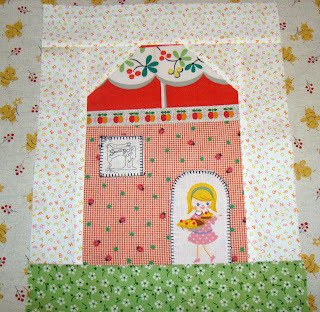 I decided to name this new house block pattern "Doll House". It is taller and smaller than the cottages and just reminded me of a little doll house. 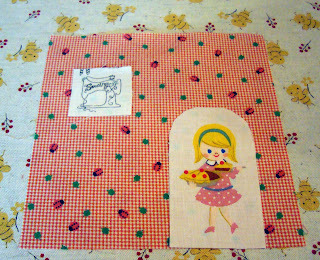 The block seemed like a perfect size for a pot holder but the Doll House could be applied to other crafts or quilt blocks. YAAY!!! I LOVE these blocks/potholders!!! Thank you sooo much for the directions! These are so sweet!!! I love them. Thank you! 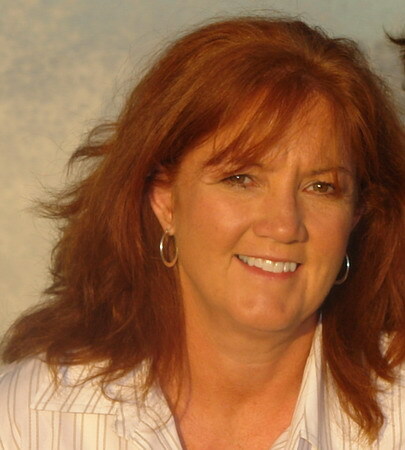 Nanette, they are beautiful - you are a Doll! You rock! Totally! I love these! and I love exclamation points!! So cute! The people and items in the windows add sooo much charm! These are just oh so cute! You've outdone yourself again! I love your variety of fabrics, and trims. Nanette, you have the best ideas ever. I have been developing a small house obsession and you are making it into a big one!! Nannette, those are lovely! Gr8 tutorial, too! These are so great! Cute, cute, cute!! oh wow I love it!especially the little japanese girl fabric in the door....how clever! thank you I will definitely be making one of these...or more! WOW!! You are a superstar!! 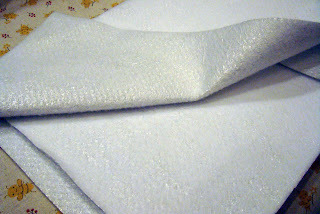 I bought some fabric that I'm going to post about tomorrow, that made me think of you! Thanks so much for sharing. These are adorable. I have my afternoon planned now...cutting out dollhouses. Really great! They are so cute and would make terrific gifts.Thanks, Nanette. Thank you Nannette. Can't wait to whip up a few! There are days when you have the itch to create something, but you don't have a ton of time. These little pot holders would be perfect for a day like that! Thanks so much for the tutorial. I can't wait to get started. They are adorable!!!!! I love these! Thank you for taking the time to "show and tell". Thanks for the tutorial. I need to start looking for fabrics I can use. They are so cute! These are way too cute and I have a feeling lots of people will be heading to their sewing space to make some. I will soon...you are so very generous to give a tutorial. Thanks Nanette! 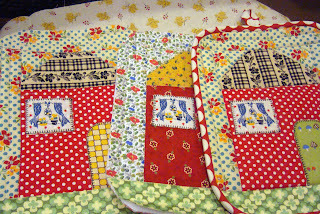 Yeah, thank you so much for sharing, one goal for 2009 was to learn to machine quilt, I only hand quilt and would love to get more things done, this would be a wonderful way to start and just like the Christmas Cottages, I can see that they will become addicting. I do have a walking foot, but now do find which number is the blanket stitch!!! Adorable - thanks for taking the time to show us the ropes. you're too much. 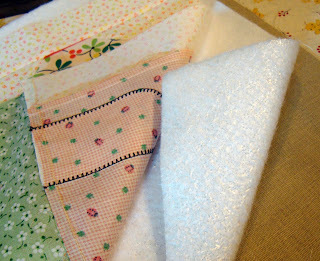 when oh when am i going to find time to make these sweet "mini-quilts". pretty soon i hope. Wow, that is so cute! You are so clever. Where did you buy the insul-bright? I'm going to have make some those, soon! They are just adorable! I can hardly wait to make some. Oh Nanette! These are SO adorable. They're just so darn cute -- look what you're doing to all of us. 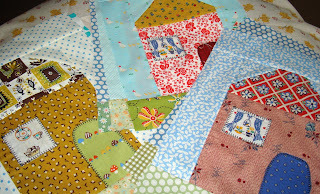 I LOVE houses and now I'm thinking I want some more! XOXO. 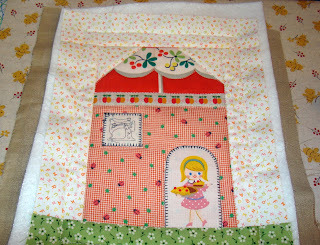 So cute- I know a little girl of mine would love one- well maybe as a mini quilt! LOL! Thanks for sharing! So now I HAVE to make them myself, huh? :) Did you get the insulbright at JoAnns? I need to see if I can get some kind of a blanket stitch out of my 35 year old machine! Thanks Nanette, cute cute cute! OMG! These are so cute...I want to make one NOW! I knew there was a reason I bought a couple of yards of Insul-Brite right after Christmas - it's that quilter's ESP again - you read my mind Nanette and now I have a terrific pattern for potholders - sooooo cute! Thanks so much! Really cute, Nanette! 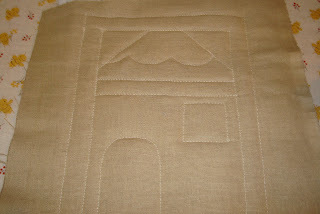 The fabrics you use really make these little pieces look like houses with real windows. 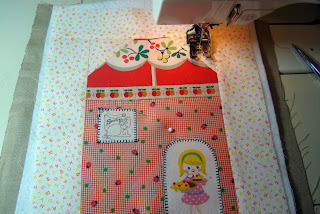 The curtain fabric is just so sweet and that little sewing machine!! Divine! Gotta get me some of that batting but snowing here and the driveway is so icy my husband can hardly stand up to shovel. Snowblowing is out of the question. 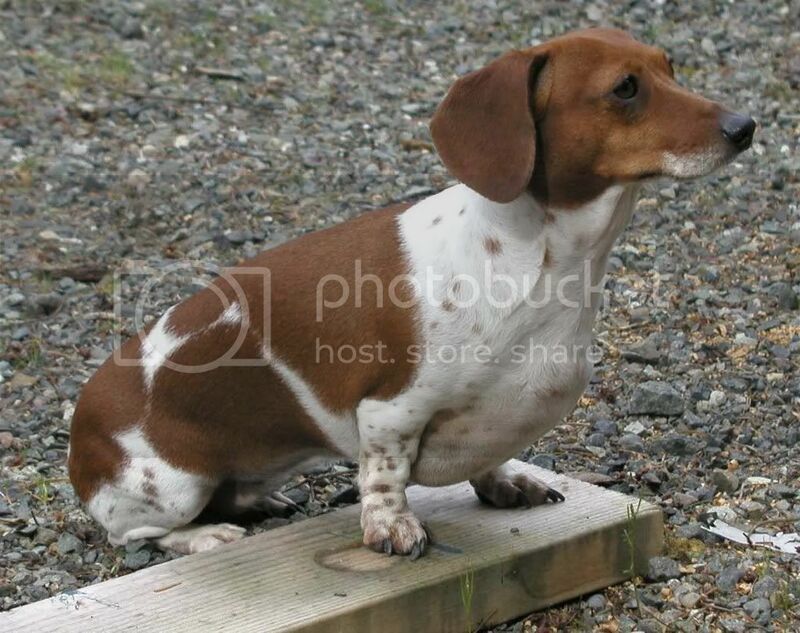 He'd slide right down our driveway and over to the neighbor's in a flash. Think I'm tired of all this snow. Oh my GOSH! These are about the cutest things ever...certainly the cutest potholders ever! Thanks for the tutorial! Yahoo!!!!! I love it. Thanks so much for the tutorial! I've had my insul-bright for a while waiting. So you just use one layer in your hotpad? No other batting? It doesn't seem thick. Thanks a lot Nanette.. I super love this! Thank you so much for the instructions. These pot holders are so cute! Oh Nanette- THese could not be any cuter! And your sewing skills are superb. Thanks SO MUCH for taking the time to do this!! Cute hotpads. 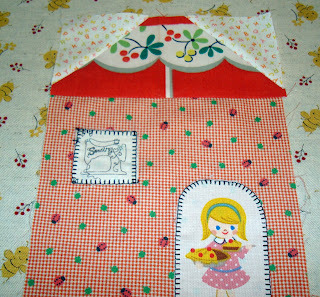 Love the fabric you find for the doors and windows. Thanks for the tutorial. Thanks for sharing your talent in this cute little tutorial. I've bookmarked it. I really want to make some. Those are so cute! Thanks for sharing! Gosh you get lots done! I love these! They're so cute! Thanks for the tutorial! Thank you for the tutorial. I showed your pot holders to my 13 year of DD and she loved them. 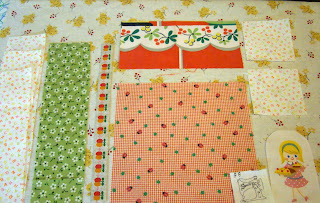 As I want her to practice some more sewing these will be perfect for her to try. Thank you so much for the tutorial! My sister uses Insulbrite in her poholders also. She will love looking at these darling little gems. VERY sweet and thank you so much for showing us step by step how to do them. OMG!!!!!!!!! how cute are those?? You are tooooo much. Love them!!! Thanks for the tutorial! 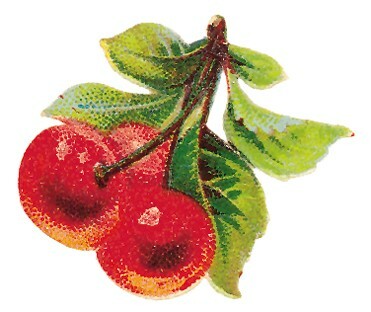 They are very sweet. I was curious how to make potholders since I heard recently that you cannot use regular batting. Thanks. So darn cute!! You are a very clever girl. Now to get the materials to maek a ton of these for Christmas presents! Thanks so much for sharing this wonderful tutorial. Oh Nanette, these are the cutest. You are so sweet to share your expertise with all of us. I must give these a try. These are great! So cute! Thanks for sharing the tutorial. Nanette, these are wonderful!! Thank you for a super tutorial. I can't wait to make a few of these!! Zip-A-Dee-Doo-Dah-Day!!! Gotta make me some...Thanks Nanette! I can't say anything that hasn't already been said, so I won't try. I love it! totally cute and so different than the christmas cottages. Sew, sew, sew cute, Nanette! I can't WAIT to make one. Thank you! I look forward to trying these. You are so generous in sharing this pattern. :-)Thank you! How adorable! My husband is in the mortgage business. those would be great gifts for new homeowners! Thanks for sharing. Wow you have done some lovely work , I love it! May I use the tutoriol? I would also love to have the Christmas cottage tutoriol, I did not have any time to join before Christmas but I had lots of fun following Eileens houses .. Here via Pam Kitty Morning. Love this and am going to try it. I'm scared to bind for some reason and these would be good mini practice runs. Can't wait to get started! Cutest potholder EVER. 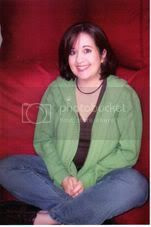 Oh my gosh Nanette, so darn cute! i'm making one of these today. Thanks for a great tutorial! 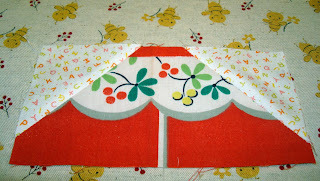 Love your fabrics!! THank you for the tutorial! I love these! This is a truly wonderful tutorial Nanette! I am loving my pot holder. It is not getting used to hold messy old pots full of food though. We are using it as a dice rolling pad for our board game we play almost every evening now.. and we get to look at that cute little house the whole game. 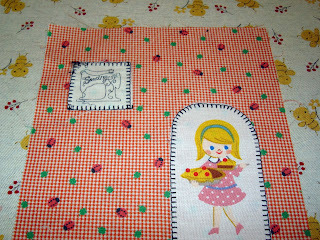 Oh my goodness, do I love that little girl potholder! How creative. Now I know you have like 5 million commenters but if ever you have a spare moment, can you tell me how you applique those pieces on ~ Do you use any of that sticky iron on stuff? 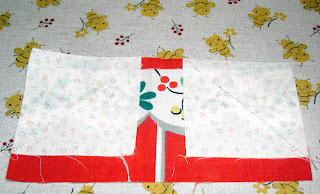 Or do you just applique it right down without turning under the ends? 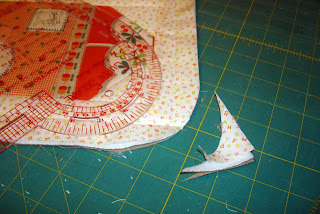 I want to work on this little chicks applique blocks but just dread turning under all those curves. I just don't think I can do it make it look good??? Well anyway, yours look great! These are DARLING!!! I'm so excited-I'll be linking! So cute! You are always whipping out the most adorable things! these are just adorable. thanks for the tutorial. Hi! Just found your blog and wanted to tell you that I love it! I've tagged it in my favorites, so will check back again soon. 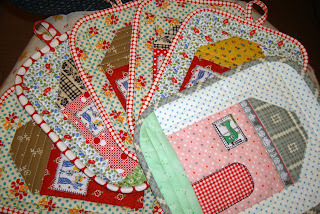 thanks for the potholder tut - i've always wanted to make those, just never jumped in. so dang cute! love the idea! check out my blog for a tutorial on nursing covers. with all those daughters someone must be pregnant! THANK YOU, THANK YOU, THANK YOU for this wonderful tutorial! I have loved these hotpads since I first saw them, and now I can create some of my own. You are just the BEST, Nanette! I love your pot holders and your blog which I've only recently discovered. Thanks for sharing. These are absolutely adorable. Now I know what my friends will be receiving for Valentines Day. Thanks so much for the inspiration! These are super cute! Thank you for sharing the tutorial!!!! 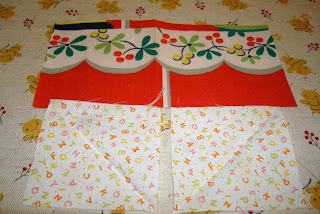 Love the All Dressed Up quilt, too. Great designs! Thank you so very much for sharing this beautiful idea and tutorial! 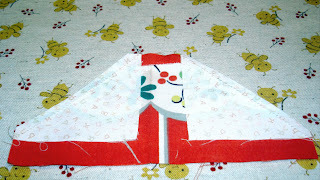 that is so lovely, to make a doll house for a man seems quite difficult, 徵信協會 got to share this article with my friends. Great job! I featured this today on my blog - Today's Top 20! Feel free to stop by and grab a button! 2 years late to this cuteness but I am going to start a dozen tomorrow. These are so cute, and your directions are very easy to follow. Thanks for sharing!! These are simply beautiful. I so want to make one (two, three or more). 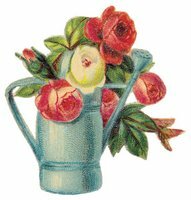 Thank you for sharing such beautiful work on your blog. thanks for sharing good post! تعمل شركة العنود علي توفير افضل الخدمات من خلال تنظيف خزانات بمكة والقضاء علي كل ما هو عالق بالخزان من شوائب وميكروبات تعمل علي تلوث المياة وانتشار الامراض للعميل لذلك عليك التأكد بصفه دورية من تنظيف و عزل خزانات بمكة تحت اشراف الشركة لانها تعمل بكل كفائه وجهد للحصول علي افضل النتائج التي جعلت منها افضل شركة تنظيف خزانات بمكة في الوقت الحالي ومن الشركات الرائده بالمملكة العربية السعودية . الاجهزه الكهربائية تعد من اهم الاشياء التي يجب توفيرها في كل المنازل لذلك توفر شركة يونيون اير مجموعه من افضل الانواع من الاجهزه الكهربائية المختلفه التي تتميز بجودتها في الصناعه مع ضمان عند الشراء علي الاجهزه لمدة 5 سنوات ضد عيوب الصناعه وتوفير فريق صيانة يونيون اير للمتابعه الدورية عن عمل الاجهزه بشكل دوري وباقل الاسعار تحت اشراف الخبراء وامهر الفنيين . احصل علي أفضل الخدمات من شركة اسفلت التي تسعي الي تحقيق مجموعه من الخدمات الخاصه والتي تقوم علي مقاولات عامه تعمل علي انشاء وتشييد احدث الطرق والكباري الامنه التي يتم تنفيذها باستخدام احدث الطرق والاساليب الخاصه والتي تعمل علي سفلته طرق وجعلها مستقيمه وخاليه من اي اعوجاج .